Please welcome this month’s interviewee, Kim Olson, nominated by Doris M. Schraft. 1. What’s your connection with Brazil and Brazilian Portuguese? The connection goes back a long way! Where I grew up, public schools began to introduce foreign languages (French or Spanish) to students in the 4th grade. I had a Spanish class a few days a week and was hooked. I had a vivacious teacher who would turn our practice of naming objects and colors into games of catch, and who stealthily prepared us to surprise our regular teacher by teaching us how to recite the Pledge of Allegiance in Spanish. In high school, I added German and was blessed to have another marvelous teacher who brought culture and language to life. During that time, I was also involved in activities that brought together a number of foreign students participating in exchange programs such as AFS and Rotary Exchange, Brazilians among them. That was my first exposure to Portuguese and Brazilians. I knew at that time that I wanted to study languages, but wasn’t quite sure what it would lead me to afterwards (I really could have benefited from ATA’s school outreach program!). My desire to be in a more international setting led me to Georgetown University in Washington, DC where I entered as a Spanish major. A meeting with the assistant dean of the School of Languages and Linguistics the summer before college got me thinking about studying Portuguese “as a way to open up more of South America.” Portuguese had not been a language offered in my school system, but I’d gotten a notion of it from meeting Brazilian students. When it came time to register for classes, I selected both Spanish and Portuguese, making the decision to leave German for a time. By my second semester, I’d officially changed my major to Portuguese and was pursuing a minor in Latin American Area Studies. Language majors were encouraged to study abroad and I was able to do so during my junior year as an International Student Exchange Program participant to PUC/RJ. After completing studies at Georgetown, I was determined to get back to Brazil and decided the best way to do that would be to go back to PUC/RJ and obtain a degree in translation. 2. After holding two undergraduate degrees in Languages/Translation, you moved to International Business for an MBA. Why did you decide to change areas? I saw this less as a change in area and more as an expanded scope of potential activities. When I returned to the U.S. after PUC, I looked for a job in Washington, DC, seeking a job in which I could use my language skills. I eventually took a support position in the Latin America and Caribbean Investment Department at the International Finance Corporation, the private-sector arm of the World Bank. I was very intrigued by the work performed there, but my non-business background proved to be somewhat of a barrier. That’s when I decided to pursue an MBA at nearby George Washington University. I earned my degree over a four-year period as I continued to work full-time and translate on the side. By the time I finished, the entrepreneurial side of business school had taken firm hold and before long, I set out to run my own business. That of course involved translation. 3. When asked where I could find more information about you, you provided me with your ProZ.com profile, as well as your LinkedIn profile. Do you think having a ProZ.com profile helps getting projects and clients? Have you ever landed any project/client through ProZ.com? As a freelancer, I have to create as many possible channels as I can for obtaining potential clients. The process of setting up my profile, selecting particular ways to describe my work and sorting through sample translations for posting helped me think through how I want to be perceived. Early on, I was diligent about checking the site daily and got a few projects. One turned out to be quite interesting – selecting snippets of audio in Portuguese to be used for language teaching purposes. That project lasted almost a year and made for a nice change of pace from straight translation. In the process of learning a foreign language, we all know that you have to be willing to step outside your comfort zone and risk sounding slightly ridiculous as you practice vocabulary, string together what you hope will be grammatically-correct sentences and hone your accent. That willingness over time translates(!) into taking chances in the professional realm, often in the form of assignments. I don’t mean straying from your languages or areas of expertise, but rather, keeping an open mind when potential projects present themselves to you. This willingness to take a chance can lead to some fascinating assignments that in turn help you build more confidence as you diversify your abilities and gain experience. Along with this willingness, I’ve also learned to embrace what appear to be new directions. I’ve learned to follow what sparks my interest, investing in it intellectually and otherwise. It’s only been in the past 10 years that my focus has moved more towards the sciences, for example. Another thing I’ve found that is also related to stepping out of the comfort zone is that I should not be shy or reluctant about engaging with colleagues. They are my greatest resources for ideas and solutions. Sometimes those solutions involve joining together to tackle a large project. 5. What have you learned so far with your experience leading a team of translators in producing the online English version of a monthly magazine published by the São Paulo Research Foundation (FAPESP)? This initial point is not new, and is reinforced as each month passes. My colleagues are incredible sources of wisdom, solutions and inspiration. I have become a better translator because of what I have learned from them. I truly enjoy the process involved in producing a high-quality translation product that allows the client to showcase its work. I thrive on the attention to detail involved in project management and I love editing the pieces and helping to finesse the articles. I’ve learned, too, that I really enjoy the variety of articles that come across my desk. Many of the subjects have sparked a desire to learn even more. The main thing I’ve learned, though, is that success can be found in many places. A challenging request from a client might just set you on a path to something fun and rewarding. 6. ATA 57 was the first time you attended an ATA Conference as a speaker. How was the experience? What are the benefits, in your opinion, of presenting at a conference? I attended my first ATA Conference in 1989 and remember being amazed at the level of knowledge and expertise people had and were willing to share. After many years of attending conferences, I reached a point where I finally thought I had something to offer as well. By then, I’d been leading the incredibly talented translators on the FAPESP project for nearly four years. It was a measure of success that I felt was worthy of talking about. I found the experience itself to very rewarding (despite my more-than-anticipated nervousness). Again, the process of preparing my presentation helped me focus on key points. My session was quite well-attended and people seemed genuinely interested in my experience. That interest and eagerness to learn more from me and my experience was extremely gratifying. I would like to nominate Diane Grosklaus Whitty. I met Diane when she became part of the current project team and we have worked together on other projects as well. I’m allowed to marvel at her beautifully rendered translations and reap the benefit of her painstaking and thorough subject-matter research on a regular basis. She inspires me! I loved reading your answers, Kim! Thank you so much for kindly accepting Doris’ nomination and my invitation! It was a pleasure e-meeting you and getting to know a bit more about you. 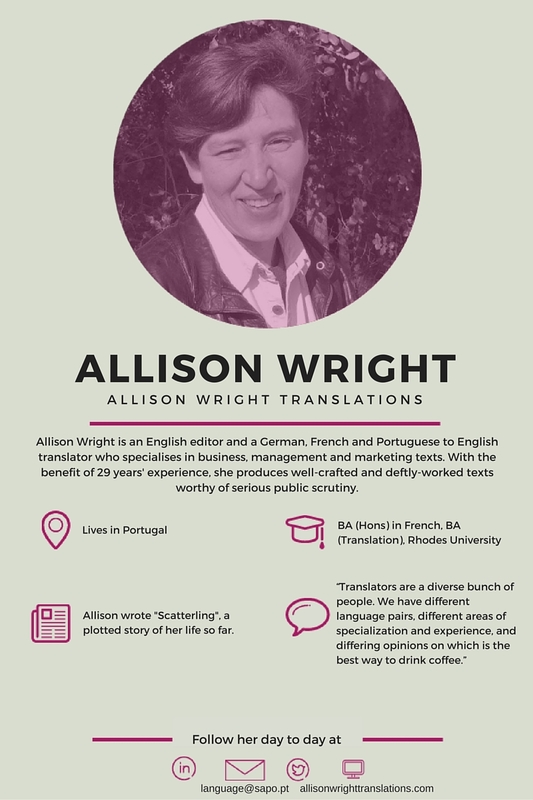 Welcome back to our Greatest Women in Translation interview series! It’s with the greatest pleasure that I introduce you to this month’s interviewee, Angela Levy, nominated by Regina Alfarano, our last interviewee. I must admit I was shocked when I saw Angela’s name on Regina’s interview. I thought: “Wow! Look how far we have come! Having Angela on my blog would be amazing, but there’s no way on Earth that she will accept it. She’s a great name in interpreting and has already been interviewed by Jô Soares! What is my blog compared to Jô’s show?” To my greatest surprise and honor, she promptly accepted it. My contact was through her daughter, Vera Levy, always kind and prompt on her e-mails. The interview is quite long, but totally worth it, I guarantee. Angela herself asked if there would be any problem in it being long, and I told her to feel free to answer however she preferred. I love great stories! Now, without further ado, welcome to my blog, Angela! 1. In your interview to Programa do Jô (a Brazilian talk show), you mentioned you learned English by yourself. How did you manage to do it at a time learning resources were limited? It’s an interesting story. My father was one of the many lawyers who worked for the Consulate and was a very close friend of American Consul General Cecil M. P. Cross, during World War II. The consul came to my home one Sunday, to give my father a lift because they were going to Santos for a Luncheon at Ilha da Palmas. The consul was early, my father was still getting prepared to leave, still dressing, etc… – and asked my sister, Anna Maria, and myself to “entertain” Cecil till he came downstairs. We were elated at the prospect: we had seldom been with the consul, but we had always loved the English language and anyone and anything that came from the States, so rejoiced at the chance of a conversation with Mr. Cross. He was a very nice, even – tempered, accessible man, and we told him we would like very much to learn to speak English, but our father would not let us have lessons. And he asked why the “Big Bad Wolf” (his nickname for my father) was being so much against our plans, and we explained it was because we were studying at a school (I was 14 and my sister 15) where we spent all day (from 7 am to 5 pm – including Saturdays) and he would let us have English classes when we were through our entire course, because then we would have time to study. And Mr. Cross said: You look as intelligent and resourceful as your father, and I’d like to make an official bet with the two of you: sign a paper stating that in one year’s time you will be speaking English as well as I do! We were game, he asked for a “nice leaf of paper”, and drew a contract, very “official looking”, stating: The undersigned, Cecil M. P. Cross, etc., etc. and the two of us (complete names, of course…) would do exactly that (explaining the bet, of course…). The three of us signed the document – which he put in his folder – and we said : “Thank you, sir”! He answered: There’s more: promise me you will not say one word about this agreement to your dad, your mom, your other sister or anyone else, anywhere else. This is between the three of us only. You promise? We did, my father came down the stairs and they left, leaving the two of us completely speechless, frightened to death of the promise we had just made, wondering how to go about it, where to start… The month was February, we were on summer holidays from school, and the first thing we did on Monday was to go downtown and scout for a book which could help us. The only thing we found (it was war, and imported books were hard to find) was The Pocket Book of Basic English. We bought it and, to our dismay, found nothing in it that we hadn’t learned in school (very basic, indeed…). So we put our minds to work, and decided to try unusual methods: movies, and American songs (we could sing a few, lyrics and all, but without understanding a word…). So we went on Tuesday to Cine Metro, on Avenida São João (now, of course , demolished), to watch “Two Girls and a Sailor”, starring Gloria De Haven, June Allison and Van Johnson… In the 2 pm show we watched the film and read the subtitles and, I can tell you that was the last time in my life when I read subtitles! The next show at 4 pm, we only watched the movie, without reading the subtitles, knowing the story from the first show and paying attention to what was being said (and not understanding about 95% of the words, I confess…). We watched that movie about 6 times during the week and also started memorizing the words to songs, and trying to write them down (in a very broken, misspelled English…). The next addition to our venture was pronunciation, because we found an old book, Pronunciation of American English Words for Brazilians, in my father’s library, at home. We belong to a very musical-linguistic family, and people say this natural ease that we have to learn sounds and imitate them perfectly (Japanese, German, whatever…) is rooted there. 2. You are the pioneer of simultaneous interpretation in Brazil. How was your first experience in simultaneous interpretation? On our way there the next morning (May 9, 1950), we were wondering what he had meant by “test the equipment”, since in our work at UCBEU the only equipment we used were two mikes – one for the speaker and one for us, for the translation (I had never heard the word “interpreting” connected with translation). “We’ll soon find out” I said. Getting there we asked for “Jack, the technician”, as the consul had told us to do. He came and I said, trying to sound very efficient: “We are the translators sent by the American consul”. He answered: “Oh! The interpreters! Come, let’s test the equipment.” And I asked him the question which betrayed me: “What equipment?” He looked “panic-striken” and asked: “But you are interpreters, right?” I answered in a flash: “Not yet, but we learn very fast…” The poor man had no choice, for the banquet was set to begin at 1 pm, and it was already 11 am. So he said, resignedly: “All right, then who is first?” I was the bold one and so I said: “I am”. He seated me at a very small table, covered with wires and strange looking apparel, handed me a pair of earphones so heavy that when I tried putting then on, my chin fell on the table and I almost broke my front teeth. And he added: “Take good care of this pair, it’s the same one used by the Japanese admiral when he surrendered to Gal. MacArthur, on Tokyo Bay, in 1945…” I was totally lost, and asked: “What am I supposed to do? How do I go about it?” And he answered: “Simple! They will start: ‘Ladies and gentlemen, it’s a pleasure to’ – and you, POOM!” “I what?” I asked, horror-striken… “You start with the Portuguese, of course… always half a sentence behind the speaker.” Incidentally, that was the first and only lesson I learned about simultaneous interpreting from somebody else. All the others I learned by “banging my head against the wall” – meaning always experimenting, groping for answers to the ever-present problems with words and all that never before I had faced. Well, the event started, it was a banquet for over 200 people, the introduction of IBM to Brazil. And our small table was placed right in the center of the room, where we could hear everybody’s voices, and the waiters shouting: “João, água na mesa 3”, and things of the sort, all the time… I don’t remember most of what I heard and had to say, but I do remember thinking: “I like this job, but this work cannot possibly be done this way, with all the noise around the interpreter…” And, zaz! I learned, by myself, my second lesson when I realized I had missed 2 sentences during my thinking spell: Don’t think of anything but the words that come to you through the earphone..
My sister said she never wanted to ever hear about or be near that “factory of loonies”, but I loved it, and went on to research how this was done in developed countries – for one thing was certain to me: real interpreters couldn’t ever work in a small table smack in the middle of the guests, the public, whoever was supposed to be listening (at this important event, there were only 9 speakers – 3 Americans, 6 Brazilians). Now, about how I discovered the existence of booths is another story, which I will keep for some other time. 3. You are co-founder of Alumni and was coordinator of the school’s Translation and Interpretation course, having trained most of the market’s professionals. What are the most important lessons you used to give your interpreting students? n) Tips on dress codes for beginners. 4. You are 87 years old, with more than 60 years of experience in the market. How do you keep your professional skills in shape? I’m 87 now and in December will turn 88. I still teach all my classes at Alumni, which is a great help in keeping my mind alert. I still do my memory drills and try to do simultaneous when I watch the News on TV. And I have a Translation/Interpreting agency with one of my daughters and my granddaughter, who is already showing great talent in both T and I. I take care of the English part of translations for our clients, but simultaneous I’ve left to my students and younger colleagues and, specially, to my granddaughter, Luiza. 5. In your interview to Diálogo Nacional, you said your dad was really important and marked your infanthood. Why? 6. You say a translation/interpreting university course is not enough to properly prepare a professional. Why not? I’m all for young people going to University, but, in my experience, at least in Brazil, translation-interpreting courses teach too many subjects which won’t be of any help in their professional career and too little of those which they will need badly in the future. Of course, in great part, the guilt lies with the official education curriculum, which they are bound to and forced to obey. But the worst feature of all is that Universities are obliged to accept all candidates who pass the entrance exam, and I personally think it’s quite impossible to prepare T/I professionals in classes with 40 or more students. Still, I always say that a university course accustoms the student to the habit of research and a methodic style of studying; hence it is very important in the professional preparation of T/I students, regardless of the main area of their study. 7. Now it’s your turn to nominate our next interviewee. What woman has inspired you in our profession and/or you consider to be a great woman in translation? I nominate Nancy Christina Tucker Martorana, an American who was my student in the 1970s and is now my colleague, working in our T/I department, teaching Simultaneous and Consecutive Interpreting ever since she graduated. I consider her a great woman in Translation because, besides being an excellent teacher of T/I, she is a perfect interpreter and translator, her work areas are many, she excels in all of them, and has a very sweet, likeable, warm personality. Once again, I’d like to thank both Vera, for kindly and friendly handling my communication with Angela, and Angela, for kindly accepting Regina’s nomination and my invitation to be interviewed for my blog. It was an honor to welcome you here and a pleasure to get to know you better. Dear readers, welcome back to our Greatest Women in Translation interview series! And today, once again, it’s with a great pleasure that I introduce you to the lovely Regina Alfarano, nominated by Luciana Meinking. 1. Let’s start talking about your “firsts”. You were part of the team that founded the second translation university course in Brazil, back in 1971. A few years after that, you also joined the staff starting the translation course at USP. Additionally, you founded the first publishing company specialized in translation publications in São Paulo, Alamo, and the first translation journal in Brazil, Tradução & Comunicação. I can only conclude you had quite an important role in introducing translation studies in Brazil. Could you tell us a bit more about these experiences you had? Those were very exciting years! And undoubtedly, times of fighting hard battles as well. Translation was not recognized as a specific area. It was seen as a “branch” of Language Courses. So, a university course was considered “unthinkable”. I heard – from active interpreters then – questions like: “Do you really think you can teach students to be translators?” “Do you honestly think Translation can be a course on its own?” Well, I am glad it did not take too many years to see Translation and Interpreting as they were originally thought to be and as they had already been in other countries! The experience was different at Ibero-americana (from 1971-1985) and USP (1979-2000). Ibero-americana held an undergraduate program, while USP held a graduate program in Translation only. Both contributed immensely for the professional development of both areas. The first translation journal – Tradução & Comunicação – was one of my most gratifying achievements. Although aware of the groundbreaking character of such endeavor, I was flabbergasted when right after Volume 1 was launched I received a letter (those were old times , when communication was carried out through letters!!!!!) from the Fedération Internationale des Traducteurs (FIT) with an invitation to present the journal at their International Congress in Vienna, Austria. META was the only translation journal in the Americas (Montréal) at the time, so Tradução & Comunicação was greeted sparklingly and immensely welcomed. 2. According to your own words, one of the most interesting projects you were ever involved in was The translations of William Kennedy in Brazil while being a Fulbright Scholar at the New York State University at Albany. Why was it so interesting? First of all, being a Fulbright Scholar was, in itself, extremely gratifying. A Fulbright Scholar in the US enjoys high respectability and is recipient of many privileges. Secondly, only in my post-doctorate could I dedicate my research to Translation Studies! USP would not accept translation projects for Master’s Degree or PhD back then. Of course my background in American Literature (Master’s Degree) and British Theater (PhD) were of great help, as was my background in Language and Linguistics. I had visited Albany before, very briefly, after reading William Kennedy’s trilogy – his Albany trilogy. This was 1990. The trilogy was added by a number of books later on. But in 1990 I was absolutely taken by the trilogy – Ironweed, Legs and Billy Phelan’s Greatest Game – and while in the United States, I decided to visit Albany. That visit increased my interest. Back to Brazil I found the translation for the 3 books. Although a trilogy, and practically three books as three chapters of one encompassing work, each was translated by a different translator, and each clearly suggesting to be totally separate. Therefore, the Albany area and its social and cultural scenario – the very core of Kennedy’s trilogy – were lost. Not only that had been lost! I decided to call the publishing house of Ironweed (Vernônia, in the Portuguese version) to try to contact the translator and understand why Kennedy’s language style had been changed (just one example: all swearing names were eliminated). I was informed that the translator could not be contacted. She used a pseudonym and had asked not to be identified! (At a time of such hard struggle for translators’ visibility, rights and copyright. I was very active both with ABRATES [Associação Brasileira de Tradutores] and SINTRA [Sindicato Nacional de Tradutores], had created ABRATES-SP, and acted as a Director of ABRATES and President of SINTRA ). And worse: she was very religious, and did not approve of swearing, so, she eliminated all the swearing words in Ironweed!!!!!!!!!!!! I was lucky to interview Mr. William Kennedy and was embarrassed to inform him of the unbelievable fact! Mr. William Kennedy had bought the house where Billy Phelan had lived, and not only preserved it but kept it untouched. It was the first and only time I actually visited the physical scenario of a book! The building, the furniture, glasses, lamp fixtures! And William Kennedy sitting in Billy Phelan’s chair and talking about his trilogy! It could not have been more interesting and more of a privilege! I was even more embarrassed, however, when he said he had never been paid for the copyright of the books published in Brazil!!!!!!!!!!!!!!!!!! Not one cent! Not one letter! How horribly embarrassing could that be???? I had the opportunity to meet Mr. William Kennedy one more time (although very briefly) in Paraty, at FLIP 2010. As one of FLIP’s guests he had very busy days and of course was highly requested by participants! 3. You describe your first experience with the translation practice as “a scuba diving initiation”. Could you tell us about your experience and how it shaped your translation career? I was 18 years old and had just returned to my hometown (Limeira, SP, Brazil) from my one-year AFS exchange program in the US. Someone called from a local hospital. They had just received new equipment imported by a wealthy man who, nearly dying, would have his last chance if the equipment could be put to work. So, they had the “brilliant” idea of calling an 18-year-old whom they thought would translate the manual. As much as I tried to tell them – as I already knew back then, in 1965, that speaking a language did not mean I would be able to translate, let alone a manual – the pressure was so high (‘The man will die if this does not work!’) that I went to the hospital. A piece of equipment, a team of medical professionals and technicians and myself, scared to death. As I translated the instructions I thought ‘I will be the next one to need emergency help here…..’. But slowly but steadily the team started activating the commands – the equipment worked and the man was saved! I felt as if a plow had gone over me! Sweating, hardly breathing, exhausted! But relieved! Would that be the reason why I would never, ever come close to translating manuals? The experience may have shaped my translation career in the sense that I do not, by any means, translate technical material, manuals, and the like. But yet, I do translate medical material, so, it may have been the “scuba diving initiation” to show the challenge, the excitement and the gratification translation can offer. Translation is not only about languages, knowledge, cultures, and all that comes with it, of course, but about those using it for those purposes: people. 4. Besides this first experience you had, you also say you had total immersion experiences that shaped your areas of specialization (poetry and medical translation). Could you tell us a bit more about them? When teaching translation I used to say to my students that only poets could translate poetry, which explained why I never included poetry in my Literary Translation Courses. At some point in time, Haroldo de Campos asked me to translate the speech he was going to deliver at a ceremony to honor Octávio Paz. The speech included some poetry. I froze when I received the originals, and immediately talked to Haroldo about it. He said he would give me support if I needed – how would anyone in this world refuse a request by and support from Haroldo de Campos? I decided to take the challenge! Of course I said I would send a first version for Haroldo’s reading, suggestions, etc. etc. To my total astonishment, he did not make any changes at all. And to my double/triple astonishment, sometime later I received a call from Régis Bonvicino, who was organizing a poetry anthology for the Brazil Exhibition in Paris. He invited me to translate Contemporary Brazilian Poets, and before I had any reaction, he added: “Haroldo said you would say you do not translate poetry, but that is not true, you do translate poetry, and he has recommended you”! Again, how could anyone refuse such invitation! And Desencontrários (Unencontraries) was my first delightful experience translating poetry. Others – just as delightful – followed, and I am glad to say I truly enjoyed ‘every word/verse/rhyme’. Working with Haroldo de Campos was most enriching, as expected. Sitting with him, reading poems and translations – invaluable and unforgettable! As for medical translation, I was caught having to check reference material for one of my projects. Those references showed so many translation problems that they could hardly be useful as references. So, I had to search, re-search and re-search for my research! The project I was involved in included doctors’ research, and again and again, high reading volume. Then, it led me to FDA material research. As the project was of high relevance, I was very involved and of course wanted to do a good, reliable job. Extensive reading and research called the attention of the doctors involved and they recommended me for an even larger project that was medical-related. After detailed information I realized I could face the challenge. That was the beginning of a fast-moving dive into medical translation. One day, my husband, a medical doctor himself, came to my desk, saw the material (we used many dictionaries back then, and many typed copies of translation….. and re-typed pages…..) and asked me: “Are you translating medical texts?” I answered I had been, for some time. He was very surprised! So, it all had to do with my own projects – it all led me quite naturally. The long-lasting AIDS projects both in Brazil and in the US were of profound involvement and partnerships. Thanks to my graduate Translation students at USP who helped me, Brazil was the only country to launch AZT on the same day and at the same time as the US. I was honored to have translated presentations by top Brazilian scientists and researchers on the model AIDS prevention project Brazil developed (and unfortunately interrupted in recent years). The bridge between poetry and medical – as odd as it may seem at first…. – reached its apogee when I translated one of Nelson Ascher’s poem – Mein Herz – from Portuguese into English. As soon as he got my version he called and asked me: “Are you a physician?” “Why do you ask?”, was my reaction. “Because you translated this poem so beautifully, and it sounds ‘medical’”! Coming from a translator of such stature, I could not doubt the ‘bridge’ was viable (and enjoyable!). 5. You say stress and adrenaline are integral parts of translation. Why and/or how? It has been proven that interpreting is the most stressful profession in the world. The study compared interpreters and surgeons! So, stress and adrenaline are part of the very nature of interpreting, of the fantastic decision-making process and rendition. Interpreting is very often referred to as ‘oral translation’. I would say that is too simplistic! But stress and adrenaline are also integral parts of translation. Clients’ turnaround needs, clients’ reviews of originals – so often – clients’ updates for materials already translated, clients’ requests for additions. And, of course, in no time at all! Clients traveling all over the world – all those requests to be delivered on time and wherever they are. The only way to meet those needs is to draw a map and have color pins to show who is where – Brazilians in Asia, Europeans in the Americas, Americans in Europe. Time zones are absolutely crucial, and projects overlap, since changes were requested after projects had been delivered. ‘The project is over’ – wishful thinking! It does come back….. and back again. When it comes to medical projects, that is potentiated. Huge projects come back for updates two, three, four years later. Many a time, clients’ staff has worked on interim versions (‘minor’, as they say…..). Medical records to be translated for patients who must travel for medical care. Documents required to import medications for all sorts of patients (and many times, children). It is an extremely stressful cycle, fighting against time and having to comply with bureaucracy. Interpreting doctors, nurses, patients and family members about very serious conditions can be the most stressful and the most intense of all experiences. Clients, medical staff in Brazil and all over the world watch the very personal, and many times very sad, testimonials, which must be rendered as any other interpreting session. To be honest – not at all like any other interpreting session. Stress and adrenaline can hardly be measured. And although trembling voice must be avoided, an interpreter is not always successful when others around are already shedding tears. [The translation profession] rewards the cumulative years of experience, which is to say, age counts positively; it encourages and demands ongoing learning, which is to say, it is intellectually healthy; it also demands recycling and updating, which is to say, it is continuously evolving; it fits in wonderfully with self-employment, which is to say, one can—or tries to!—manage one’s own working days and hours. 6. You give your students two key pieces of advice: 1. Do not charge less than you deserve for your work; never, ever charge more than you believe you deserve for your work. ; and 2. Choose what you really like to do as a profession, and above all, have fun doing it. Why do you think these are the most important pieces of advice to give to translation students? Dignity is crucial in life – personal life and professional life. Every professional deserves to be compensated for the work done, which goes without saying. But competition may interfere, and ‘professionals’ trying to find jobs unfortunately do charge humiliating fees. So, that is the first part of the first piece of advice: do not charge less than you deserve and the professional field finds to be common sense. And how to find out? Very easily: through professional associations, translation unions, international associations, peers. Competition must never interfere with dignity. On the other end, if a professional is aware of how to charge for the work done, that is what should guide his/her attitude – never, ever charge more. Translators are so often, too often in fact, faced by urgency, by extreme clients’ needs (a few examples above), by the literal plea ‘charge whatever you want’. Of course there are urgency fees, but that is a different issue altogether. There are also pro-bono projects, which are extremely important, gratifying, and no doubt made evident by their own nature. As for regular projects, translators must present their fees very clearly, from the start. Clients should ideally receive a document which shows all services to be rendered, all situations under which they can be rendered, and just as translators expect clients to comply, so must they. As for liking what we do as a profession, and above all, have fun doing it, I pose a question: how do we feel every time we have to do something that we do not find pleasant, or likeable? It is definitely not a good feeling. When involving others, the result will certainly not be satisfactory. When involving professionals, it can be nearly disastrous! Translation in itself is about making decisions. So, the crucial decision is: I want to be a translator, I like to be a translator, I enjoy what I do, and I have fun doing it (despite all the stress). Then, the decision making process at the core of translating will flow more smoothly. It would never flow otherwise, I am sure. 7. Now it’s your turn to nominate someone you admire and that is a great woman in translation. I can think of a number of great women in translation. The one I choose to nominate is Angela Levy. A pioneer in interpreting in Brazil, a prominent translator and outstanding translation/interpreting teacher, Angela has trained and inspired so many translators and interpreters. Angela is to be admired and respected as a professional, as an amazing human being, and as a long-time peer and friend. Welcome back to our wonderful and inspiring Greatest Women in Translation series! Our last interviewee, Muriel Vasconcellos, decided to write a tribute to her role model, Deanna Hammond, whose life was cut short by pancreatic cancer at the age of 55. My nomination for this month’s Greatest Woman in Translation is a colleague who unfortunately is no longer with us. More than anyone I ever worked with, Deanna Hammond deserves to be recognized for the breadth of her contributions to the profession. She enriched the field and set an example in many different roles: not only as the head of an important translation service and a hands-on practitioner of the craft, but also as a leader of the translation community in the United States, an author, and a teacher. Her life was cut short by pancreatic cancer at the age of 55. While shouldering this serious responsibility, Deanna also found time to contribute unstintingly to the advancement of our profession. During her two decades of service with the ATA, she was active in many of its efforts to raise public awareness about the work and professionalism of translators. First elected to its Board of Directors in 1979, she served two terms as secretary of the Association and ultimately held the positions of president-elect (1987-1989) and president (1989-1991). As president-elect, she organized two annual conferences attended by nearly 1,000 members and negotiated contracts for meeting venues for six years into the future. She embarked on her presidency with the intention of putting ATA’s house in order, an effort that included rewriting the Association’s bylaws and moving ATA headquarters to the Washington, D.C., area. In addition, she worked on improving the accreditation program and increasing the number of translation courses and degrees offered by higher learning institutions across the United States. While striving to advance the profession, she also found herself facing challenges that arose with wisdom and integrity. Her contributions were acknowledged in 1992 with the Association’s highest award, the Alexander Gode medal for distinguished service to the translation profession. Deanna also served the profession in other capacities — for example, as head of the U.S. delegation to the Statutory Congress of the International Translation Federation in 1990 and as president of the Interlingua Institute from 1993 until her death. She took an interest in machine translation and provided extensive advice during the formative years of the International Association for Machine Translation and the Association for Machine Translation in the Americas. In this role, she and I worked closely together. Her wisdom and experience were key to taking what had been an idea sketched out on the back of an envelope, so to speak, and transforming it into a vibrant worldwide system. We were both committed to seeing that MT was used for appropriate applications and not as a substitute for real translation. In addition, Deanna published extensively on professional issues in the field of translation, authoring articles in such publications as the Congressional Record, the Modern Language Journal, the Annals of Political Science, and the ATA Chronicle. She was also editor Volume VII of the ATA Monograph Series, Professional Issues for Translators and Interpreters. Whenever she had knowledge or experience to share, Deanna was a tireless mentor. She was especially committed to supporting aspiring translators. She taught courses in Spanish-to-English translation at The American University in Washington, D.C., in the early 1990s and at George Mason University in Fairfax, Virginia, from 1993 until 1996. In fact, she was a teacher before she was a translator. Her first job was as a teacher at the superior school in Pullman, Washington. She then traveled to Colombia, South America, where she taught English as a second language from 1964 to 1967, first in Medellín as a Peace Corps volunteer and later at the Industrial University of Santander. She also taught ESL at Northern Virginia Community College from 1974 to 1977. In addition, she was an active member of the Association of Teachers of Spanish and Portuguese. Born in Calgary, Alberta, Canada, in 1942 of a Canadian father and an American mother, Deanna spent her early years in the area of Port Angeles, Washington. She earned a bachelor’s degree at Washington State University, a master’s degree in linguistics from the University of Ohio, and a Ph.D. in Spanish linguistics from Georgetown University. She was a member of the Phi Beta Kappa and Phi Beta Phi honor societies. Her life of devotion to service extended beyond translation. In the 1990s, as her participation in ATA came to a close, she became active in Zonta International, a worldwide organization of executives in business and the professions working together to advance the status of women. She was president of her local Alexandria Club and was ultimately appointed East Coast International Chair. I have never met anyone so outgoing despite her shy nature, so serious despite her wild sense of humor, so focused despite the thousand ongoing projects in her head, and so compassionate despite the antagonism that her determination sometimes brought out in others. The material for this article came from Deanna’s Wikipedia entry, an obituary by Jane Morgan Zorrilla at the link above, other obituaries, and personal recollections. Since we reached a dead end, our next interviewee will be, once again, nominated by me. This time, I decided to choose one of my Brazilian role models, Melissa Harkin. Welcome back to our interview series, dear readers! Please meet Muriel Vasconcellos, nominated by Allison Wright, and be as amazed as I were with her life lessons. 1. You are a translator from Portuguese and Spanish to English with more than 40 years of experience in the fields you mention above. I can see where your expertise in linguistics comes from (you hold a Ph.D. in Linguistics from Georgetown University), but what about the rest of your expertise? Most of it comes from on-the-job experience, learning while doing, with the benefit of excellent coaching during the early years of my career. After working in administration and translating on the side for several years, I landed my first real job as a wordsmith with the Organization of American States in Washington, D.C. I was both an editor and a translator in the Department of Social Affairs, and the documents covered a wide variety of topics that affect developing countries. My supervisor, Betty Robinson, was brilliant and taught me a lot. In addition, during much of my time in that position I was detailed to the Language Services Division, where senior translators reviewed my work and generously shared their wisdom – always tactfully, never in the spirit of showing off. After six years at the OAS, I applied for a position with the Pan American Health Organization (PAHO), the World Health Organization’s American regional office, in its Department of Research Development and Coordination. I was responsible for publishing a series of monographs and my work included editing, translating, précis-writing at scientific meetings, and report-writing. My boss, Dr. Maurício Martins da Silva, set aside an hour every morning before work to tutor me in the biomedical sciences. I repaid him by working long hours and on weekends. Dr. Maurício was a born teacher and I owe my understanding of science to him. 2. You also taught translation at Georgetown University for 14 years. How do you think this experience as a translation teacher helped (or still helps) you as a translator? Teaching translation gave me a whole different perspective on the process. It was the first time I began to analyze the techniques that before I had been using intuitively. I needed to understand what happens in translation in order to empower my students. The tools, formulas, and solutions that I developed for them are constantly in the back of my mind, guiding me in my work. 3. You were the president of the International Association for Machine Translation for two years and founder and president of the Association for Machine Translation in the Americas for six years. You are also the editor of a collection of contributions on the translator workstation and the use of computer aids and full machine translation, entitled “Technology as Translation Strategy”. Besides, during the time you worked at the Pan American Health Organization/World Health Organization, you introduced machine translation and developed strategies to facilitate post-editing. Can you tell us a bit more about MT from your point of view? Having been up close and personal with machine translation for 35 years, I have a lot of thoughts on the subject. I have expressed them in more than 50 published articles, most of them posted on my website. My first exposure to MT was a five-year stint as assistant to the director of the Machine Translation Project at Georgetown, Professor Léon Dostert, when I came to know all the key researchers and other players in the field. I wrote about this experience in an article titled The Georgetown Project and Léon Dostert. It’s fair to say that the Georgetown Project laid the groundwork for extensive use of information-only MT by the United States Government. Since the 1960s, MT has been effective as an information-gathering tool. There’s little doubt that it has revolutionized the gathering of scientific intelligence. MT has also enabled businesses, starting with Xerox, to launch products in multiple markets simultaneously. Over the years, the Xerox model has been replicated by many large companies. Other applications, like weather reports in Canada, have been successful largely because the vocabulary and syntax are relatively limited. PAHO began to develop its own Spanish-English MT system in 1978. The office’s managers had been sold on the naïve idea that medical texts would easily lend themselves to mechanization. I was placed in charge of the program the following year and we quickly realized that we were faced with a wide range of subject matter, various genres, and vastly different writing styles. Even the strictly medical texts covered a large number of specialties. The Spanish-English system (SPANAM), developed in-house by a team of Georgetown-trained computational linguists headed by Marjory León, was the first to become operational in 1980. English-Spanish (ENGSPAN) debuted later. Both of them have turned out to be robust general-purpose systems and they continue to be improved under the direction of Julia Aymerich. There is also a system from Portuguese to English that still needs work. I used SPANAM in-house for 12 years, while at the same time supervising a team of contractors, and I have continued to use it as a contractor myself since 1992. When it comes to professional translators in the role of posteditors, I would say that not everyone can adjust their style to minimize the effort involved. Many of us find it hard not to change the output; the decision to leave it alone is frustrating in itself, as we always prefer our own style. The process is also stressful because MT does not eliminate the need to look at the source text. The translator has to be thinking of strategies for fixing the target output, more often needed than not, while still carefully following the source, like patting her head and rubbing her tummy at the same time. It’s a demanding skill. PAHO pays its translators well for their effort. The rate is only slightly lower than the level paid by international organizations for “human” translation, and the office has been able to recruit a strong team of professionals working both in the house and as contractors. Perhaps my years of experience as an editor have given me a leg up. There are times when I get frustrated and times when I’m grateful that “the machine” has made my work easier. I also do regular translation for many other clients, so I have ample opportunity to compare the two processes, which are very different. One problem is that my vision has deteriorated; working on-screen is increasingly difficult for me as I get older. At this point in my career, I like nothing better than to read a sentence in the source language and then close my eyes to process it in my head while letting the translation flow through my fingers. This is how I work best and make the fewest mistakes. An added benefit is that the result sounds more natural. To conclude, I believe that MT postediting can be used to achieve polished, high-quality translations under the following conditions: the posteditors are professional translators in mid-career (I don’t recommend it for beginners); they are open to taking on the task; they have good keyboard skills; and they are adequately compensated. Using MT as an excuse to exploit translators or hiring non-translators as posteditors are unfortunate trends that should be discouraged. 4. According to your own words, you are “passionately interested in Brazil.” I know your late husband was a Brazilian in political exile when you met, back in 1970. Was he the (only) reason for this passion for the country? My passion for Brazil began when I started to learn Portuguese. I had taken a break from my university education and was studying business Spanish at the Latin American Institute in New York City. My schedule had an empty slot and my advisor suggested that I sign up for Introductory Portuguese. What a life-changer that was! I have been in love with the language and the Brazilian people ever since. Returning to Washington, I transferred to Georgetown University’s newly established Institute of Languages and Linguistics, where I opted for a double major in Spanish and Portuguese in the bachelor’s degree program. While my graduate major was linguistics, I continued with a double language minor for both the master’s and the Ph.D. At Georgetown, all the courses on Spanish and Portuguese linguistics were taught in the respective languages. I met my Brazilian husband after I finished my bachelor’s degree and before I went back to graduate school. He was definitely a factor in my decision to resume my studies. 5. You wrote a memoir, Finding My Invincible Summer, published in late 2012, about your experience with breast cancer. In your words, “a diagnosis of six months to live turns out to be a gift”. Why? First I’d like to mention that my book also covers a key period in my translation career. I wanted to give up editing and become a full-time translator. After my cancer diagnosis prevented that from happening (for insurance reasons), I got involved in machine translation – and the rest, as they say, is history. On a personal level, having cancer totally changed my approach to life. The experience taught me that our thoughts create our reality and that we have the capacity to channel our thinking in positive and constructive directions that promote health, joy, and abundance. It’s not hard. Our lives are enriched to the extent that we are grateful for what we already have. 6. You wrote that you walked away from conventional treatment and practiced gentle approaches to becoming and staying well. Could you tell us a bit more about these approaches? The turning point in my healing process was biofeedback. Through exposure to machines that monitored my stress levels, I was able to hear the storm of electric static that came up when I was feeling challenged. I learned that stressful thoughts arouse the fight-or-flight response that draws on our emergency reserves and literally beats up our bodies unless we can break the vicious cycle and return to equilibrium, or what they call homeostasis. The biofeedback trainers showed me evidence that keeping the body constantly on edge through negative thinking was one of the main causes of chronic disease. The key to breaking the cycle is deep relaxation. People get similar help from meditation, prayer, and sometimes acupuncture (massage is relaxing, but it’s too distracting to achieve deep relaxation). Whatever it takes, the idea is to stop the tapes that buzz in the head and connect with the essence and power of the present moment. In the beginning I listened to guided relaxation tapes for two and three hours a day. Later I purchased a chi-machine, which has supported my daily deep relaxation process for over 20 years. Over the years I have enhanced this practice with techniques that help to keep me healthy. Physically, they include belly breathing, jaw jiggling, stretching, walking, biking, stair-climbing, and any other activity that I really enjoy. I try to maintain a sugar- and grain-free diet, minimize dairy, and emphasize healthy fats like ghee and coconut, MCT, fish, flaxseed, and olive oils. Mentally, I do visualization and constantly question my thoughts using a technique similar to Byron Katie’s “Is it true that …? Is it really true that …?” I have embraced Chinese medicine and homeopathy and I avoid prescription medicines whenever possible. Finally, perhaps most important, I have surrounded myself with like-minded people. 7. According to Emma Goldsmith, in her review of the book, you managed “to study and work as a translator in seemingly impossible circumstances”. How did you do it? You aren’t the first person to ask that question! I answered it in a blog. I explained that I didn’t have any distractions back then: no e-mail, no Internet, no social media, no cell phone; no radio or television. I was totally immersed in my work. I thought about it while getting dressed, driving my short commutes to the office and school, eating at my desk, walking the dog, and even soaking in the tub – where I often got my best inspiration. I certainly couldn’t do it today. My focus is pulled in a thousand different directions by distractions that we didn’t used to have. 8. Now it’s your turn. Who would you like to invite to be our next interviewee in the Greatest Women in Translation series? If it’s all right with you, I’d like to take this opportunity to recognize the contributions of Deanna Hammond, a past president of the American Translators Association whose strong and wise leadership navigated the ATA through difficult waters. In her day job, she was head of the translation service at the United States Library of Congress for many years. Deanna would be here to tell her own story if her life hadn’t been cut short by pancreatic cancer at the age of 55. I was deeply touched and amazed by your story, Muriel. A million thanks for accepting Allison’s nomination to be part of our series! It was a great honor to welcome you here and to be able to e-meet you. Since Muriel’s nomination is no longer living, she will write a tribute to Deanna Hammond, instead of our normal interview. In April, we will be back with the interviews featuring another one of my personal role models (this time a Brazilian one) so we are back on the loop. Stay tuned! Happy New Year, dear readers! And welcome back to our (belated) Greatest Women in Translation series! I just couldn’t find the time between the holidays and the hectic beginning of the year to post this month’s interview. But, as I always say, better late than never, right? I hope you enjoy our new interviewee, the great Allison Wright, nominated by Sabine Lammersdorf. Thank you, Caroline, for the interesting questions which make up this interview. They certainly gave me food for thought! I do need to mention that I still have a problem with the adjective “great” being applied to me. Perhaps we should edit that to read “most verbose” instead? 1. You were born in Kitwe, Zambia. At the age of 2, your family moved to Johannesburg, South Africa. When you were 8, your family moved again to Harare, Zimbabwe, where you completed your schooling. After that, you spent 4 years at Rhodes University, in Grahamstown, South Africa, where you received a Bachelor’s degree in Translation and a postgraduate Honours degree in French. After your studies, you returned to Zimbabwe, where you remained for the next 22 years working. Finally, in 2008, you moved to Portugal, where you are based now. Wow! That’s quite a lot of moving about. What made you move to Portugal after living for so long in Africa? How did this affect your translation career? The migration pattern described above is very common for all manner of people from southern Africa; the resultant “diaspora” has spread all over the world. Although my partner of 28 years is Portuguese, I was the one who wanted to move to Portugal because when on holiday here two years before we arrived for good, I felt a strong affinity with the semi-rural village in which I now live, despite only having a handful of Portuguese words in my pocket at the time. The other motivation was one of survival. Various decisions made and policies pursued by the Government of Zimbabwe, particularly in the ten years preceding my departure, caused a series of successive economic crises each one more severe than the last. The day before I left Zimbabwe in early October 2008, the annual rate of inflation posted at one investment bank I used to visit often was 231 million percent – as if anyone can even conceive of such a figure! Less than five weeks later, the country reached levels of true hyperinflation with an estimated rate of inflation of 79.6 billion percent, comparable with rates experienced under Germany’s Weimar Republic. We emigrated a mere seven weeks after making the decision to do so. I am a British citizen (one of my favourite jokes is that if I can be British, then anyone can) and my partner is a citizen of Portugal, so moving to an EU country was relatively straightforward. We sold almost everything we had and managed to buy our air tickets and pay for the shipping of a few treasured possessions. Savings (entirely from translation work) equivalent to six or seven months’ worth of living expenses in Portugal and no real idea of how I was going to make things work formed the basis of our fresh start in a new country shortly before I turned 44. I should add that I love living in Portugal and now consider it my home. As a result of the move, my translation career came to a halt. The bulk of my clients were NGOs active in development cooperation in Zimbabwe and the SADC region. Their various bilateral and multilateral agreements stated that locally or regionally resident personnel had to be used for “support services” of which translation was considered one. Simultaneously, my other large regular client, headquartered in France, experienced a radical organisational restructuring and I was advised by the new managing director that alternative arrangements had been made for their translation requirements. Nevertheless, within two months of arriving in Portugal I had registered with the tax authorities as a freelance translator – which, coincidentally, is what my passport said I was – and have been bound by law ever since to render unto Caesar that which is Caesar’s, something which keeps my somewhat non-conformist self in check. 2. You are a member of the recently created APTRAD (Portuguese Association of Translators and Interpreters). Why did you become an APTRAD member? I have been an accredited member (Fr-En and De-En translation) of SATI, the South African Translators’ Institute since 2001, having joined as a member the year before that. Last year I was honoured to be invited to mark French to English accreditation examinations for SATI, which so far has not been an onerous task. While in Zimbabwe, living 2,000 kilometres from SATI’s headquarters made it difficult to participate in the Institute’s activities, which I would have done had I lived closer. Until APTRAD was formally constituted in February 2014, there was no comparable association for translators and interpreters in Portugal. All seven of APTRAD’s founders are themselves professional translators of good repute. Its President, Paula Pinto Ribeiro, has long had the dream to put in place a dynamic organisation which assists new translators and interpreters in integrating into the market and provides a platform which will allow issues affecting existing professionals to be addressed more effectively through concerted action. I became a member because I believe that membership of such associations not only gives one credibility as a professional but also enables one to make a contribution to the profession, if only at the level of paying the membership fee. Apart from that, I agree with the objects stated in APTRAD’s Articles of Association and, perhaps more importantly, subscribe to its Code of Ethics. APTRAD has already held awareness-raising presentations at all the leading universities in Portugal, embarked on a training series in Portuguese, and is currently running its first mentoring programme which is set to last three months in which 8 mentors and 9 mentorees are participating. There is one other reason why I joined APTRAD which is equally compelling: I like every single Portuguese translator I have met in person and a good many I have met online. They are a great bunch of people who more often than not encourage each other, and perhaps this is what has motivated me to take part in the mentoring programme, and to torture APTRAD members in the Algarve with my less than perfect Portuguese as their local APTRAD representative. In that respect, I am quite an odd choice! 3. As I was compiling these questions, APTRAD announced that you will be one of the speakers at its first international conference to be held in June 2016. Could you tell us a bit about the topic you will talk about (Collaboration Essentials)? Other than saying the presentation focuses on examining a people-centred approach to clients and others who populate our technology-driven world, I would prefer to keep the actual content under wraps until the conference itself. After the conference, I shall be happy to make the content freely available. 4. Speaking of collaboration, you mention on one of your blog posts that you think collaboration is key? How and why? Perhaps I should preface my answer by saying that the job of a translator is to translate. Because it is our job, it is up to us to develop our translation competence constantly. This is a professional responsibility we owe to ourselves and to our clients. It is also something which requires hours of private study, private reading of a host of material from a variety of sources, paying attention to our environment (such as that strange new advert on the side of a bus, for example) as well as a good deal of serious thought. I am not referring to continuous professional development (CPD) here; I am speaking about the honing of our translation skills alone and in private. Collaboration, by definition, is not a solitary activity. It is simply working with someone, as opposed to working for someone. I have a rather broad definition of a collaborator, and include in it anyone you work with who helps you achieve your objective which, one would hope, is to translate accurately, well, and by the deadline given for the assignment, whether a one-hour rush job or a large project lasting several weeks or months. At the level of the translator-client relationship (and I include agencies under the term “client”), I am of the view that despite huge advances in technology, the most effective approach in acquiring and keeping clients is one where you focus on the human aspect. Connecting with people and focusing on working with them to achieve what becomes your mutual objective (getting the job done) seems to me to engender a greater degree of cooperation among all those involved than if you do not. This interpersonal interaction – which often has very little to do with the job of translation itself – is often the driving force behind the generation of more work, and better paid work, as a result of the closer understanding between the translator and the client. I also dealt with the matter of collaboration slightly differently in a guest blog on Catherine Translates written in May 2012, although the underlying ideas are the same. As you can see, the “how” part of your question has no single, easy answer. The “why” is simpler to answer: Collaboration is key because it improves the quality of your translations and, as intimated above, creates opportunities for further collaboration – also known as “more work”. 5. As already mentioned, you also have a blog, That elusive pair of jeans, where, as Sabine Lammersdorf said, you write eloquently. And I do have to agree with her. I really enjoy reading your posts. How do you think blogging can help translators? There is no doubt in my mind that blogging on translation matters does help other translators. I have gained many insights over the years from content published by other translators, and regularly set aside part of my weekend to enjoy the latest offerings. There is a wealth of information which one can absorb. Reading translation blogs helps us stay abreast of events within our profession and developments in translation-related technology and offers a searchable space for the exchange of ideas which is less ephemeral than Facebook, for example. I especially love the comments section of active blogs, and would encourage more translators to comment more freely. It is an excellent way for translators to get to know each other. How blogging benefits the translators who do blog is different for each individual. For me, blogging helps me clarify precisely what I think about something. Blogging is a form of relaxation for me; the taming of stray thoughts which occur but have to be temporarily ignored when chasing translation deadlines. I find it therapeutic! That elusive pair of jeans was never intended purely as a translation blog. My chief intention when blogging is to write things of my own, as a corollary to the writing one must do as part the translation process. Occasionally, I find myself writing about translation matters, but I do not fit into the category of person who finds joy in writing blogs entitled, “50 Ways to Leave your Lover” or similar − and indeed, I find such blogs hard to read, although they are useful to many readers as checklists. Since November 2014, I have had a second blog on my translation website where content is restricted to translation matters and the style is slightly more formal. Contrary to conventional wisdom, I never follow a blogging schedule, and only write when I feel like it! 6. Everywhere on your blog and website you clearly state your copyright. Have you ever had any problem related to copyright? Why do you think it is important to clearly state it? The chief stumbling block in discussing copyright and its nefarious cousin, plagiarism, is that people tend to think of these two as abstract concepts. Abstract they are not. Far from it; they are real. Asserting copyright is, as the word suggests, a right. Infringing or violating someone else’s copyright is a crime. Plagiarism is an infringement of copyright. Because my words intentionally followed the cadence of the now common saying “that there is no such things as a free lunch”, and therefore sounded familiar to me, I was careful before publishing my blog to search various word strings to ensure that no one had written this before. No one had. Less than an hour later, a young translator in a Portuguese-language translators’ group on Facebook posted these two sentences of mine without inverted commas, without attribution to me, and without any link or reference to the blog in question, and certainly without my permission. Just those two sentences in a Facebook “update” bearing her name; nothing else. I called her out on it straight away quite plainly and said that I had just written those words on my blog and she should acknowledge her source. In response, she was unapologetic, asked me how I knew they were my original words (! ), embarked on a stream of uncalled-for rudeness, and refused outright to acknowledge that she had done anything wrong despite other group members urging her to do so, and despite the several “chances” I gave her, as well as providing her with numerous definitions of plagiarism cited from authoritative sources on the web. Her utter lack of respect for copyright (and for me, I suppose) resulted in her being barred from the group. It is since that day that I have clearly stated my copyright in more than one place on my blog. I have also come across plagiarism in translation. The first time was when I took on a “rephrasing” assignment, ostensibly to improve the English of the writer, whose native tongue was Arabic and who had written an article intended for submission to an academic journal. He had, it would appear, received his doctorate based on a thesis (in Arabic) on a similar topic. Since I am a stickler for correct terminology, I was once again methodically searching word strings of the English text which I had rephrased to ensure that the edited version conformed to standard terminology within the subject field concerned. I repeatedly encountered academic articles by one particular writer in English. Whole paragraphs were strikingly similar, if not lifted wholesale. The only non-plagiarised part of the article was the section containing the Arabic author’s own research data. I phoned the agency. The project manager was as unconcerned as the end client, evidently, about this problem, and instructed me to “change the English text some more” so that one could not tell that the text was basically the same as the original author’s. I refused on principle, and sent the unfinished mess back straight away. I was paid a token for my troubles. That was the one and only time I ever worked with that agency. It was long before I had a website or a blog. My first website (July 2011) included a section on plagiarism in my terms and conditions as does my current one. I find plagiarism abhorrent and would certainly defend my copyright were I ever to discover that it had been violated. I respect everyone else’s copyright, and am careful not to misquote. It is not too much to ask others to do the same. 7. I really enjoyed learning more about you on your LinkedIn profile. You mention extra information in your job descriptions that makes it interesting to read. For example, I especially liked that you mention an experience as a laundry worker, explaining the reason for that (lack of the Portuguese language knowledge when you moved to Portugal) and saying that it confirmed what you had always known – that translation was your thing. Do you think the way you present yourself online helps you be noticed and differentiate yourself from other translators? I had to mention that jolly laundry, since it accounts for 18 months of my life, and it is unwise to leave great gaps on one’s CV! The fact is that I knew from the age of 15 that I definitely wanted to be a translator. LinkedIn is useful, as it serves as a repository for the details of my corporate career (laundry work apart, I mean!) spanning 22 years. I worked in-house as a secretary and translator for three years in my first job, and for 20 of those 22 years, I worked part-time as a freelance translator. The term “part-time” is somewhat of a misnomer, since soon after starting to freelance, I was frequently clocking over 40 hours of translation work per week in addition to my full-time job, and in 1995 and 1996, weekly translation hours in excess of 60 were not unusual. I gave up playing golf, which I had been doing since the age of 12, because I preferred translation. I suppose I can identify with that freelance translator definition of a weekend: two working days before Monday. I think a presence online is necessary for most freelance translators, although I can think of dozens for whom online visibility would not generate them additional work nor is it desirable, given the highly confidential work that they do. I am not particularly concerned about whether I am “noticed” online or not, and apart from sharing blogs I write, I have never adopted a targeted marketing strategy online to acquire clients. When other translators do share a blog of mine, I am gratified to the extent that they have found something in that blog worth sharing. That I am to some extent visible online does, I believe, assist in verifying my bona fides when potential clients follow the links I supply them in job applications, and so on. Where perhaps I do come across as a little different from many is that I try to present myself as honestly as possible rather than portray a strictly “professional” image − hence the always very up-to-date photographs, due for across the board renewal soon. What you see is definitely what you get, except in real life I tend to swear more and laugh more. As far as differentiating myself from other translators is concerned, I think this is more properly the ambit of my clients, and I would hope that they base their opinion on the translations and other work that I do for them and the manner in which I communicate with them. While obviously and justifiably I do put my best foot forward when trying to acquire a potential client, as does everybody else, I do not see myself as being particularly competitive, since I honestly believe that there is abundant work for everyone. We simply have to find it! 8. You translated Vine Atlas of Spain and Portugal – History, Terroir and Ampelography from German into English (125,000 words) which later appeared on the Vine to Wine Circle portal together with additional material (over 80,000 words) from Portuguese into English. Could you tell us briefly how you found this experience? Demanding, interesting, exhausting, exhilarating and extremely rewarding! I translated those 125,000 German words without the use of a CAT tool, you know. Although I did the Portuguese to English translation in Trados one year later, I had no TM and only De-En glossaries of my own in Excel to help me. It was also a strange experience: during the four months actually spent doing the De-En translation, I only ever dreamt in Portuguese; I went to sleep thinking in Portuguese and woke up the same way. As soon as I was awake, the German and English parts of my brain revved up to full throttle (except when reading articles in Spanish – not one of my languages! – in the course of research). Through that experience I also learned that I cannot translate for 8 hours or more per day for longer than 23 consecutive days without a break, and I have not tried to break that record since. It is good to know your limitations. 9. Now it’s your turn. I’m curious to know who your role model is and who you have nominated for our next Great Woman in Translation. Well, my true role model is neither a woman nor a translator, but a former boss in the corporate world with whom I had the very great privilege of working for four years, and with whom I maintained a friendship after his retirement until he died in 2006. He also swore and laughed a lot. I will play by your rules, though, Caroline! There is a female Brazilian Portuguese to English translator based in California whom I have admired for many years and who has graciously accepted my nomination. I gather from various private enquiries I have made of several colleagues that she is little known among the younger generation of translators. I admire her for the sheer volume of the body of work she has translated; her significant contribution academically and in practise to the translation profession; her sound, measured advice in ProZ forum discussions and elsewhere for many years ; and her tenacity and stamina in the face of enormous challenges in her life. Above all, I admire her for her crisp, honest and evocative writing style in her published memoirs, “Finding My Invincible Summer”. Her name is Muriel Vasconscellos.